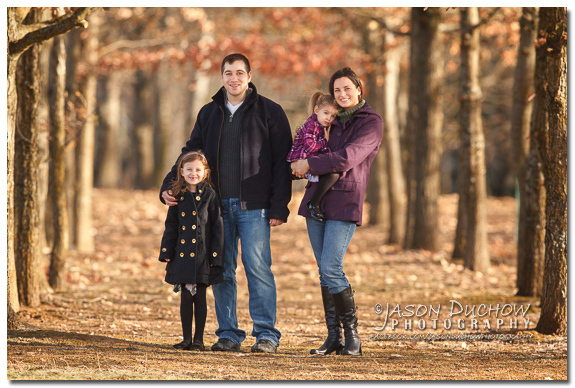 We lucked out with a rare partly sunny January day for this fun family portrait shoot near Newport. 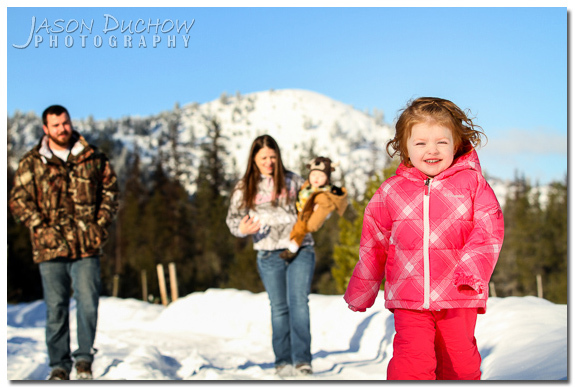 The bright sun and highly reflective snow creates it’s share of photographic challenges but the rewards can be so much fun! 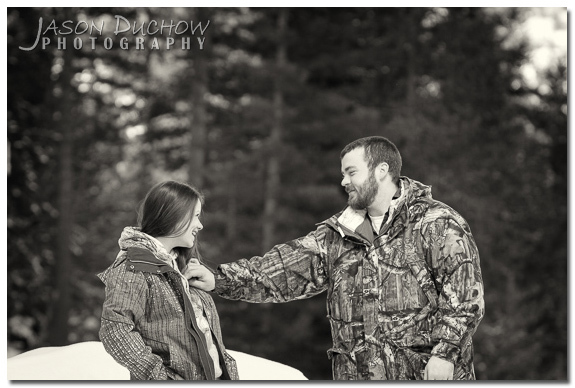 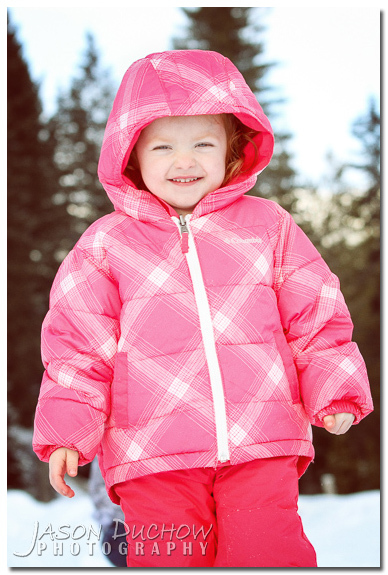 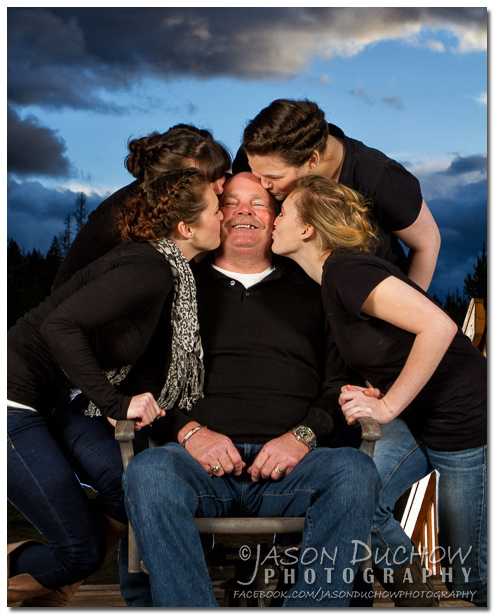 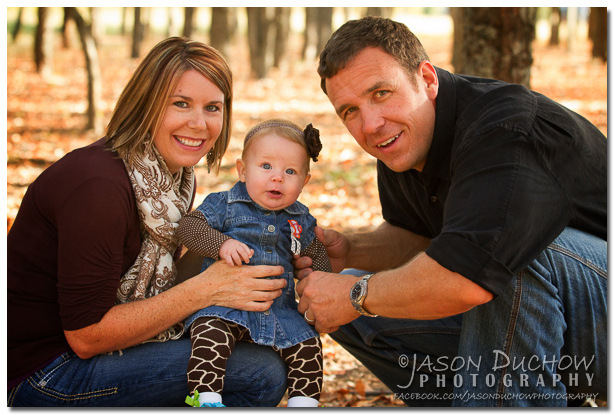 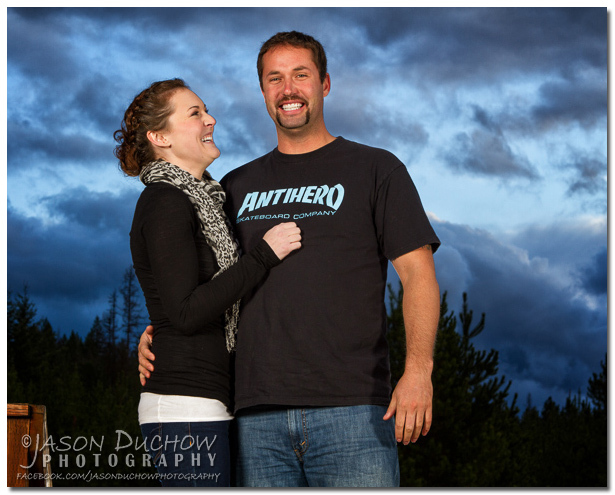 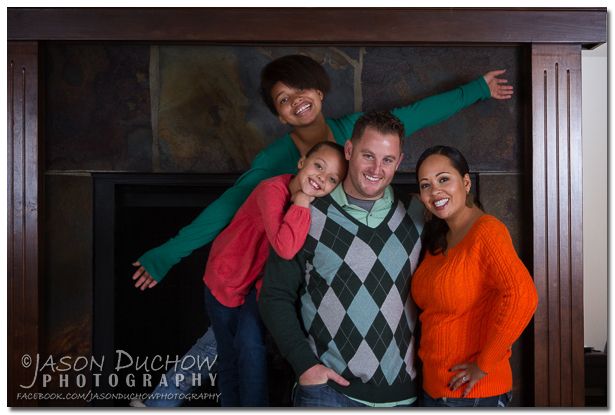 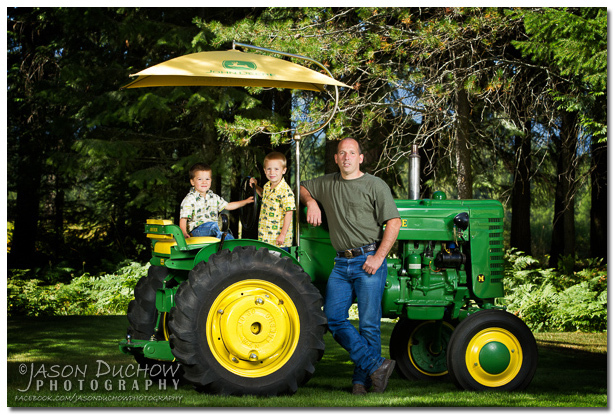 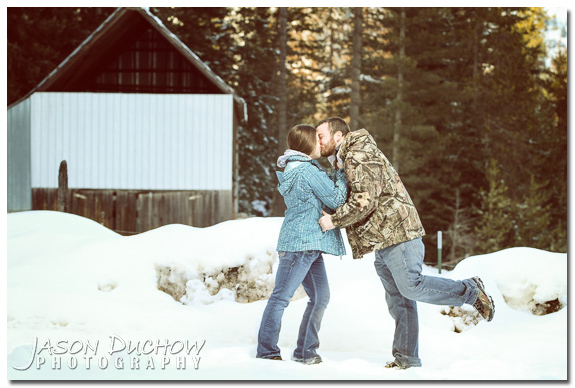 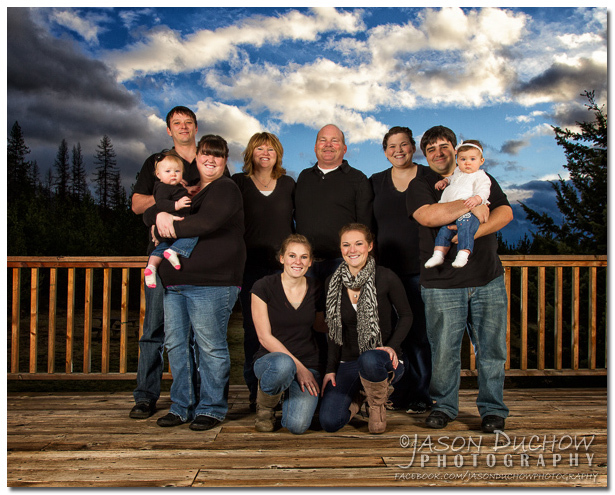 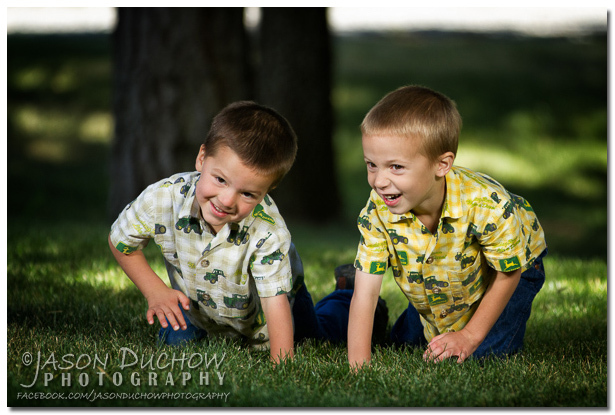 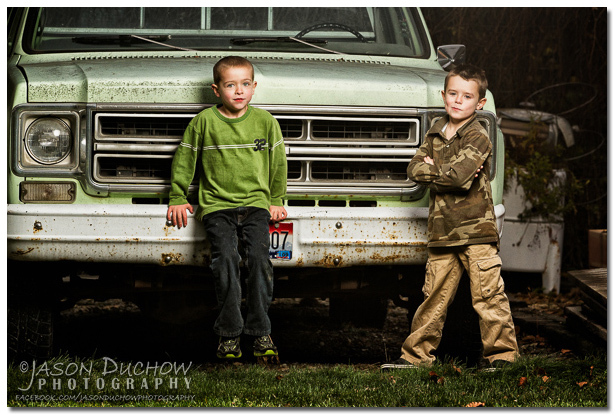 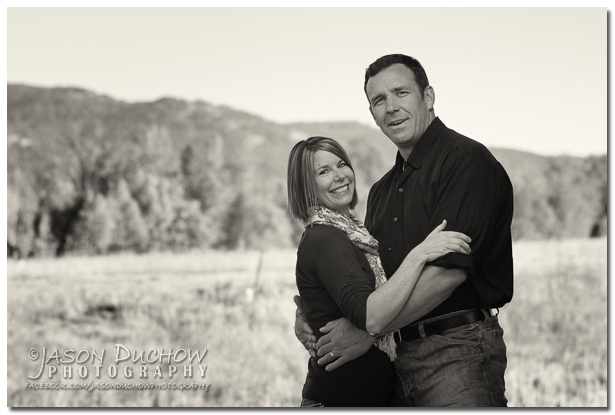 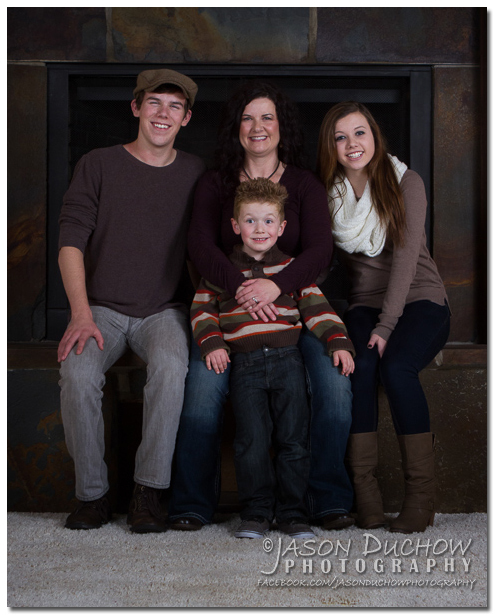 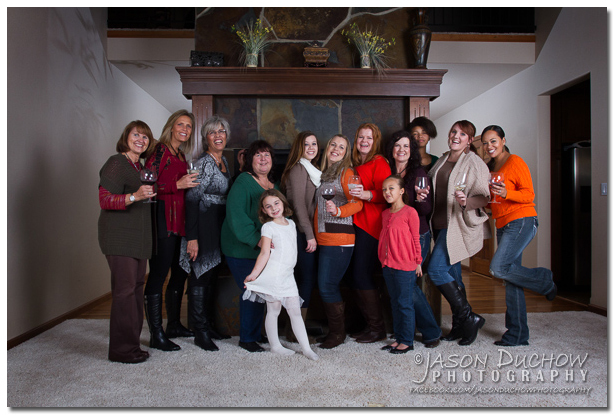 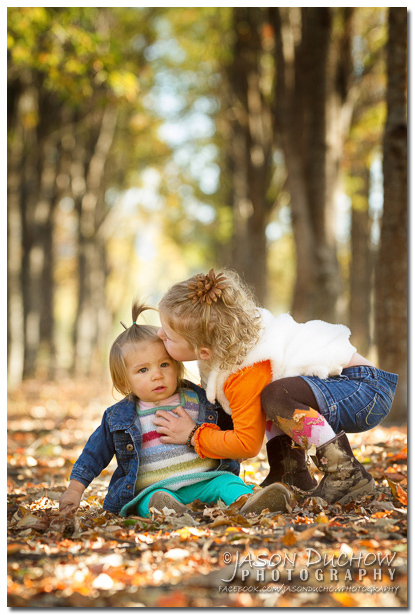 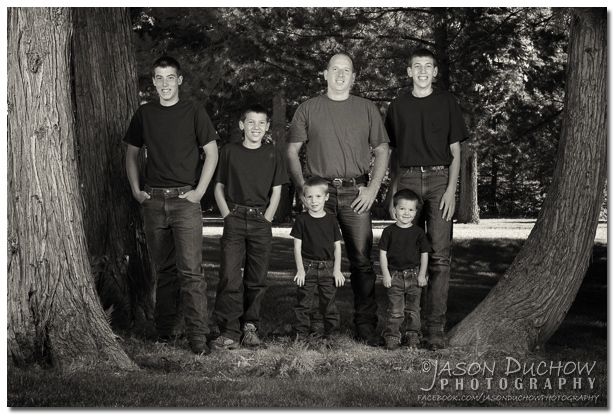 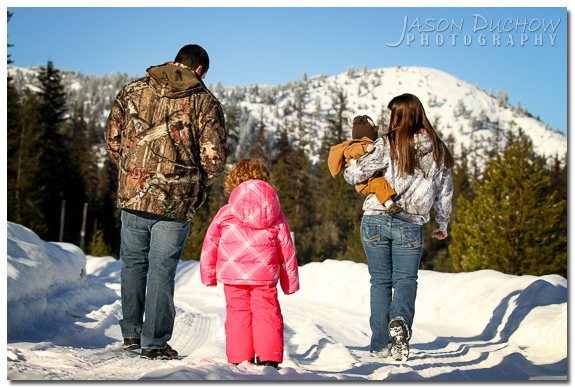 Jason Duchow Photography is located near Priest River Idaho and serves all of Northern Idaho and Eastern Washington. 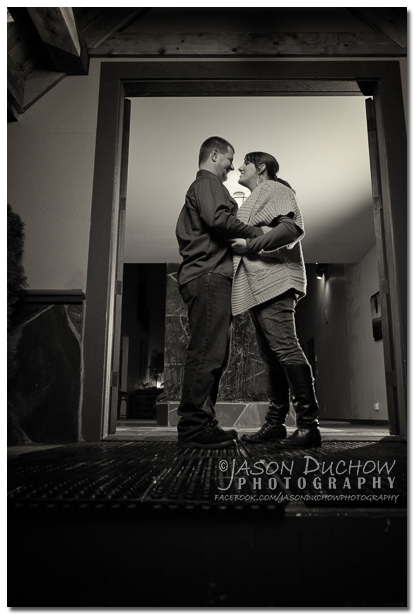 Jason specializes in on location portrait photography and often employs the the use of dramatic lighting techniques to create his distinctive style. 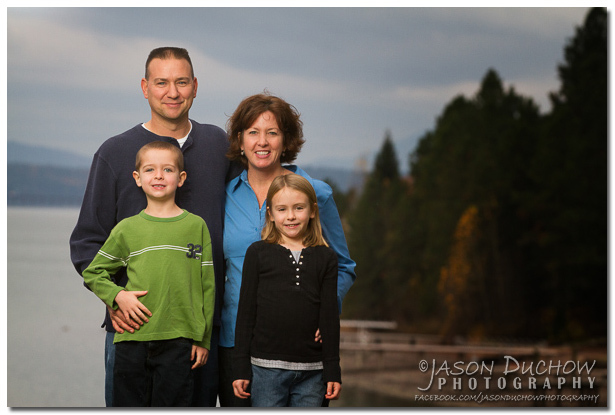 Jason also does freelance work providing top quality sports photography for www.idahosports.com, The Coeur d’Alene Press, The Bonner County Daily Bee, Priest River Times and Newport Miner. 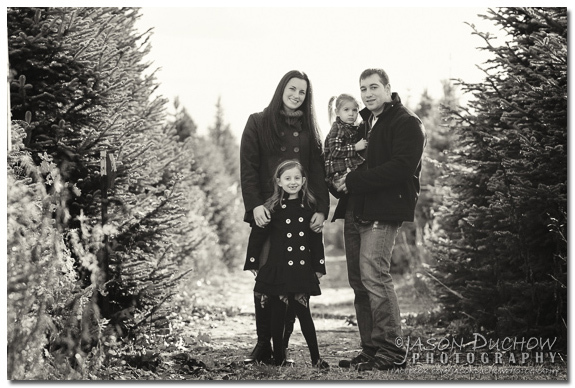 These photos were shot back in early October with the plans of using them for Christmas cards and gifts, so as to not be the Grinch that stole the surprise I have waited until after Christmas to publish them! 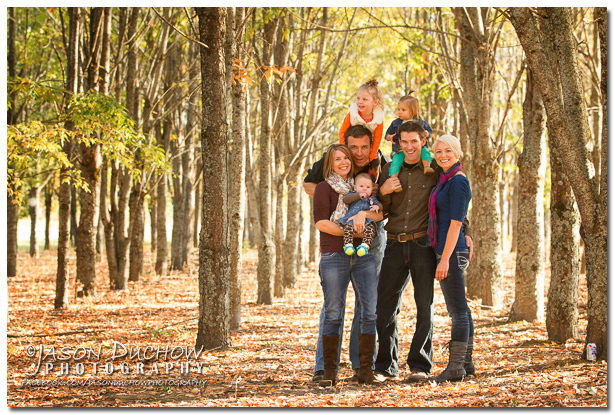 We had such a great combination of colors for this early fall family photos shoot, with the use of a nice big diffuser we were able shoot almost exclusively with natural light which makes life much simpler when you are photographing a family with three kiddos! 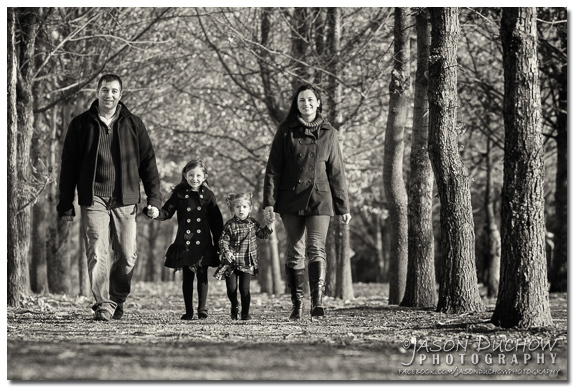 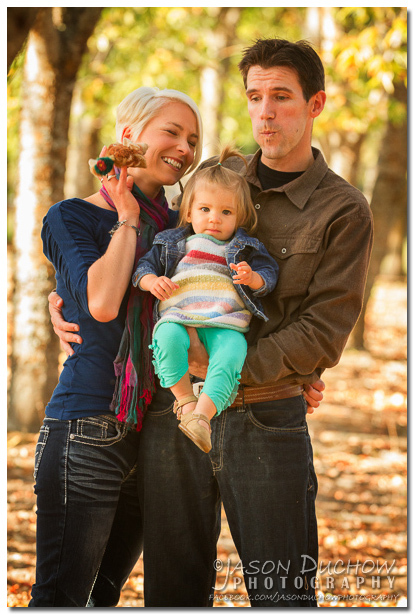 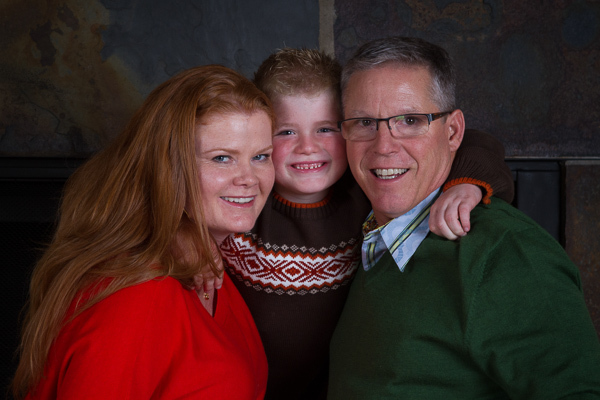 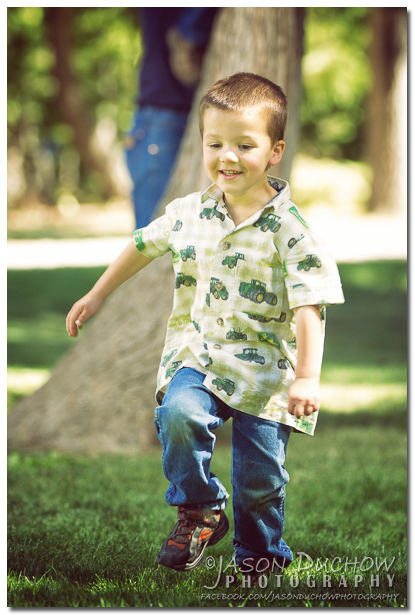 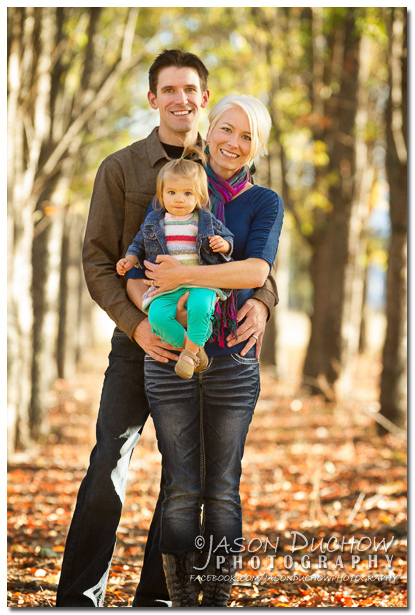 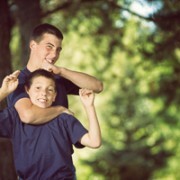 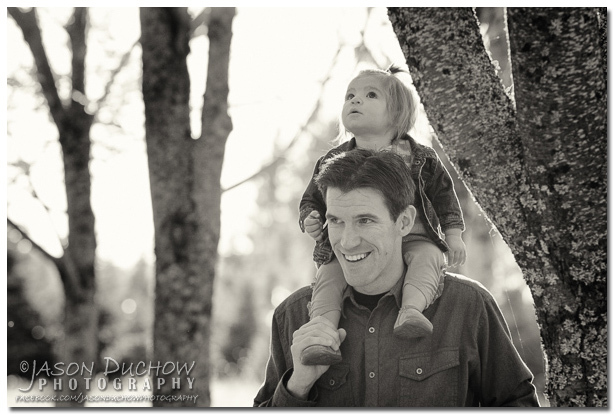 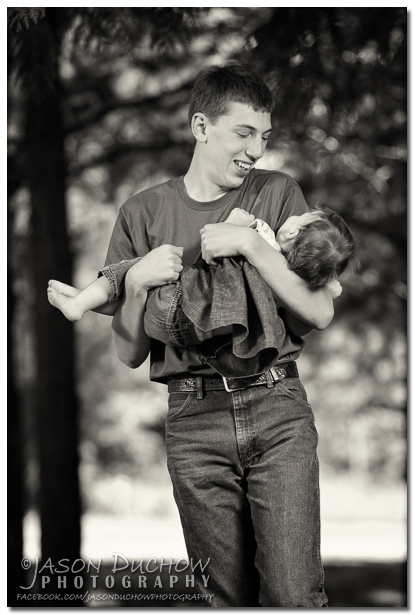 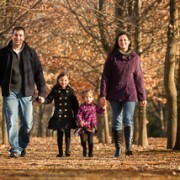 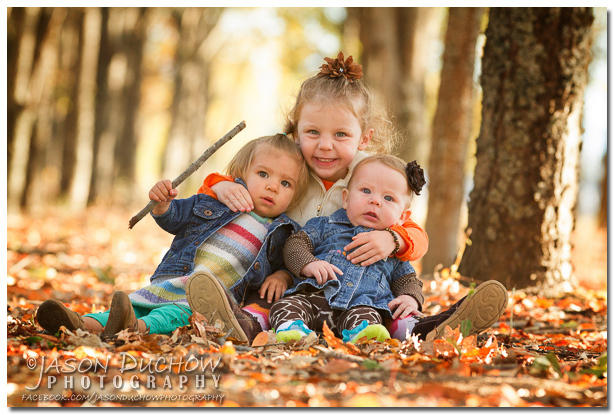 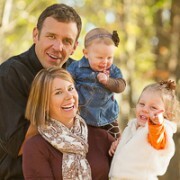 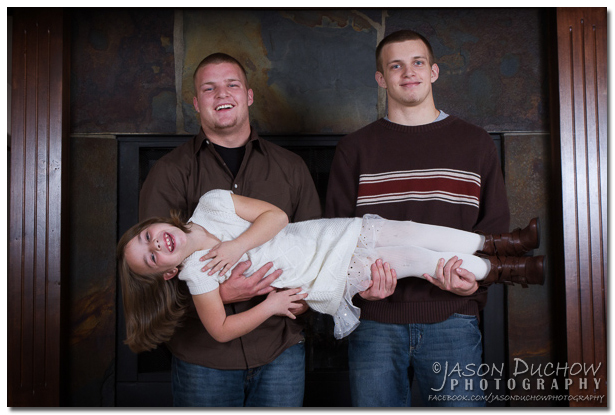 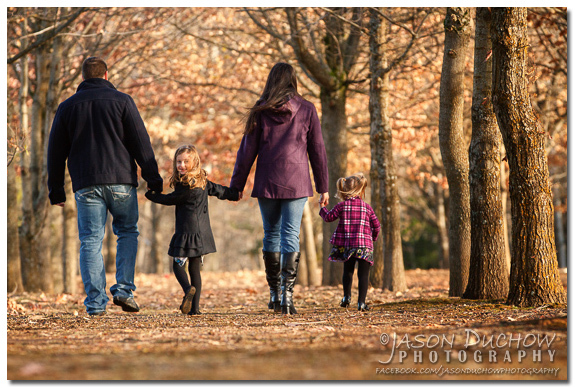 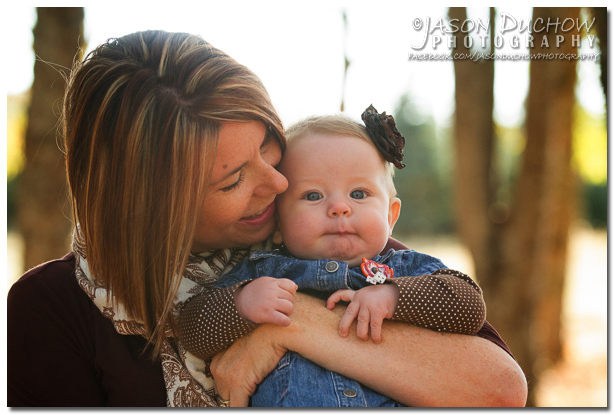 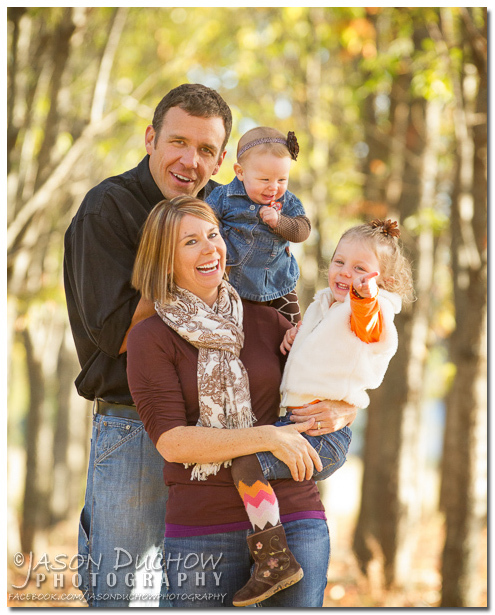 I met up with the Abbott family for a “Dad and Kiddo Friendly” family mini-session. 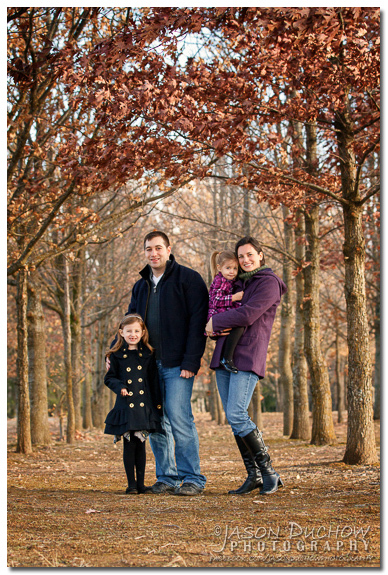 The goal was to get a great shot for Christmas cards while avoiding hypothermia. 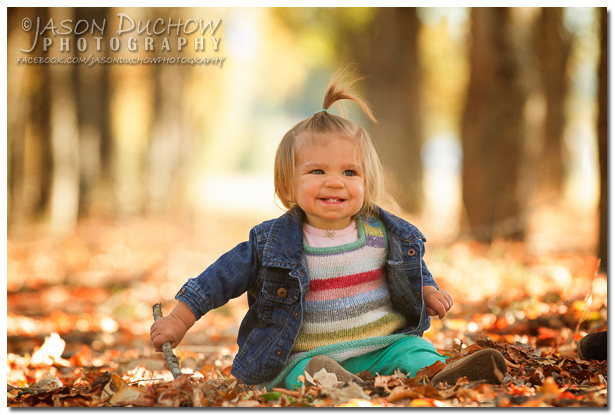 Most of the trees in the Sandpoint area had decided to shed their nice fall leaves for the winter but thankfully we were still able to find a spot that was still holding on to a remnant of fall color. 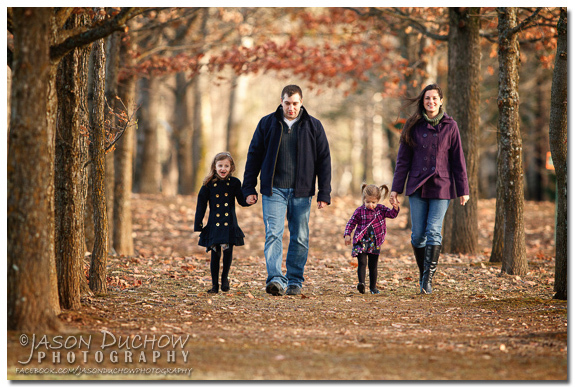 Here are a handful of the shots we were able to get in our short session. 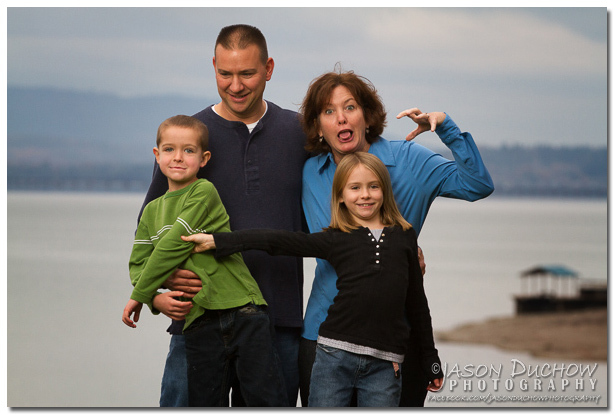 No, this quite turn around was not prompted, I am sure glad I did not miss it! 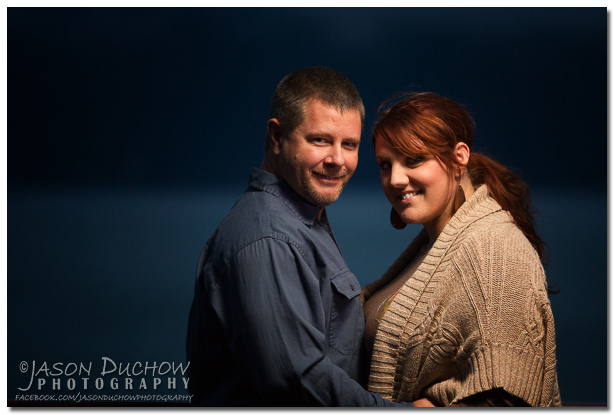 We wanted to get one more look in our time together so we picked a spot where we could get a kind of washed out, back lit look to a few of the shots. 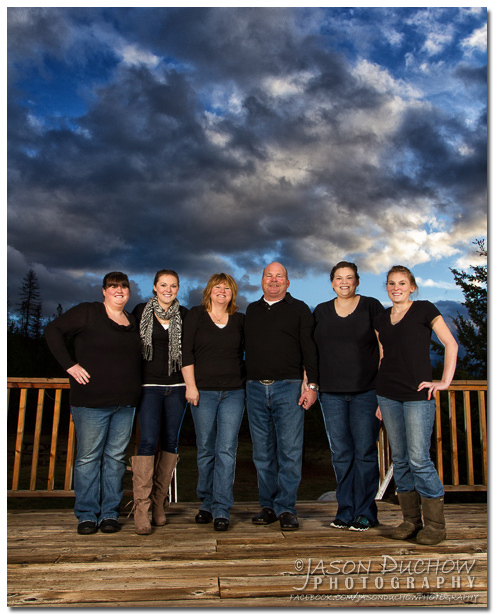 It was a little chilly for this family portrait shoot but we had our lights set up on their back porch which was only a few steps away from the warmth of the house! 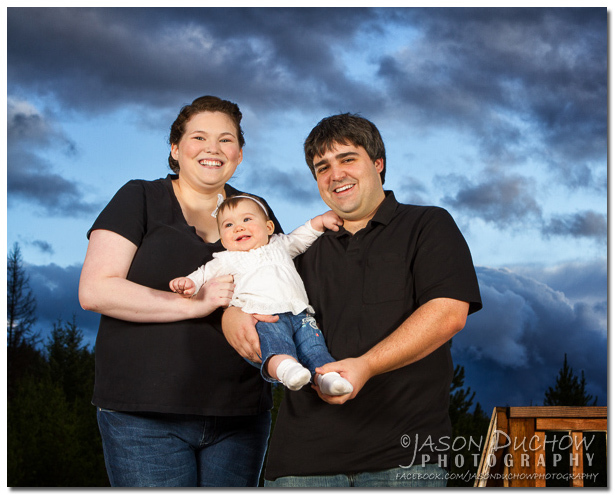 There was also a bit of a breeze, but as you will see in the photos that kept the clouds moving so even in a short period of time we had a different looking backdrop in every photo. 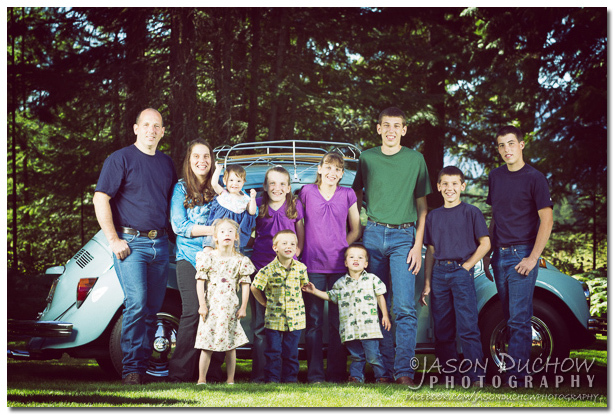 My family has had the pleasure of attending church with the Klynstra family for the last couple of years and our kids adore each other, which makes the purpose of these family photos a little heartbreaking for them. 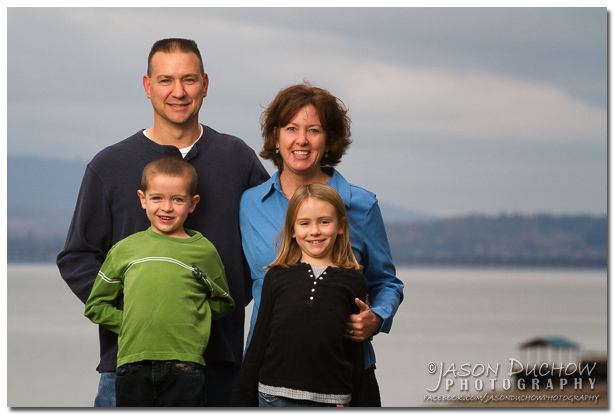 This wonderful family is heading off to serve in the mission field for Mission Aviation Fellowship and they needed a good family photo for their prayer cards. 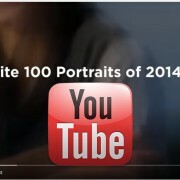 I was glad to help them out, it only took us a few minutes to get the kind of format that M.A.F. 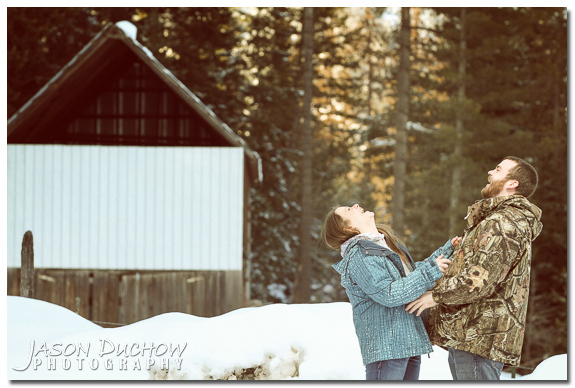 needed and then spend some time getting a few bonus photos for both of our families. 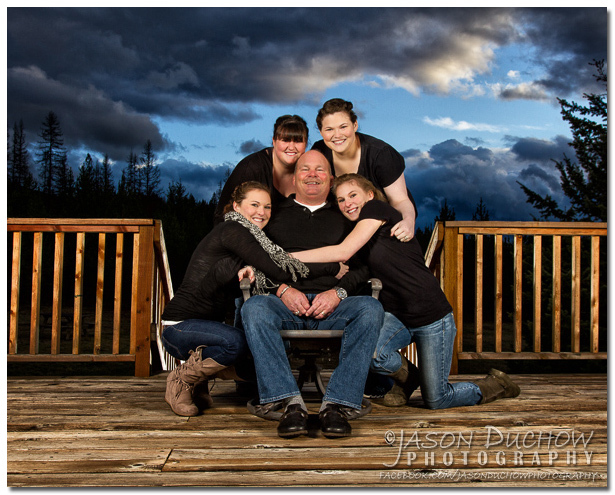 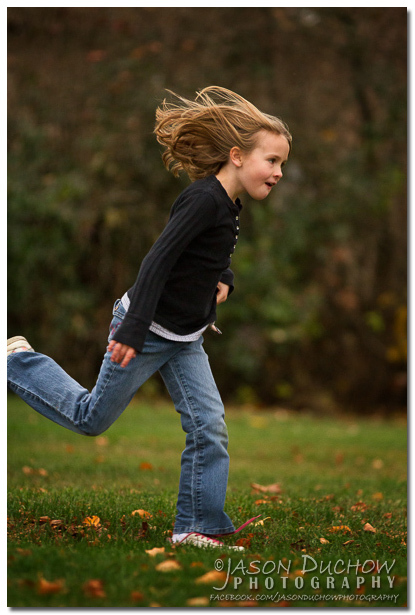 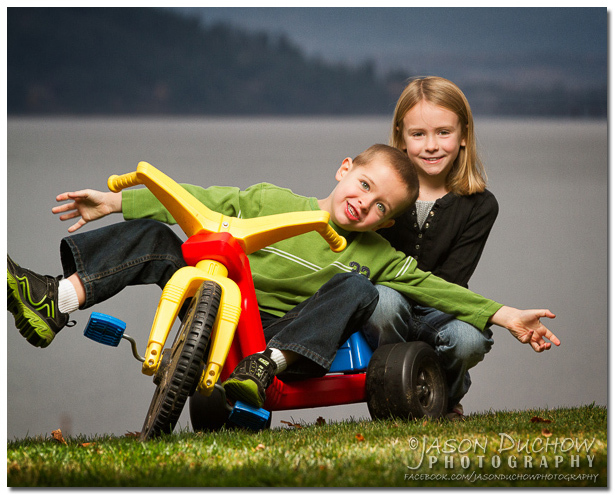 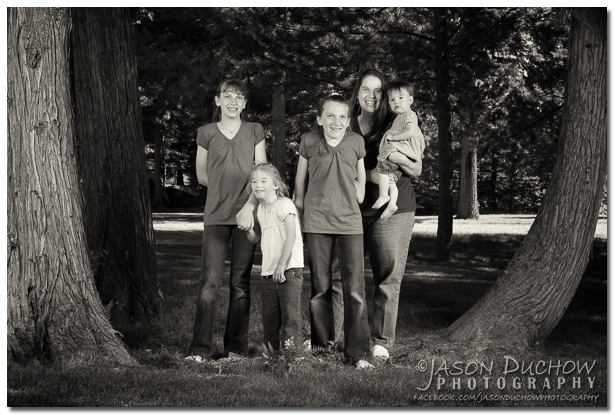 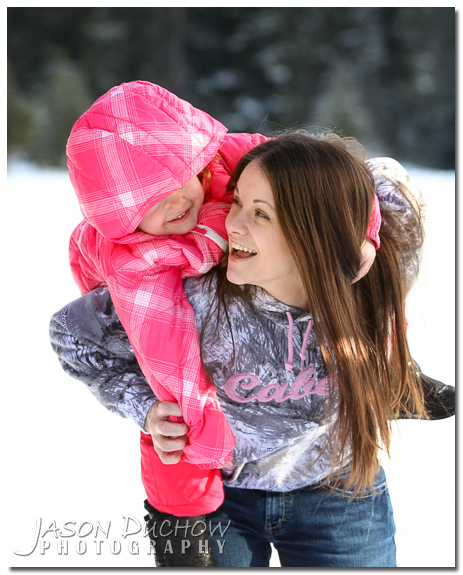 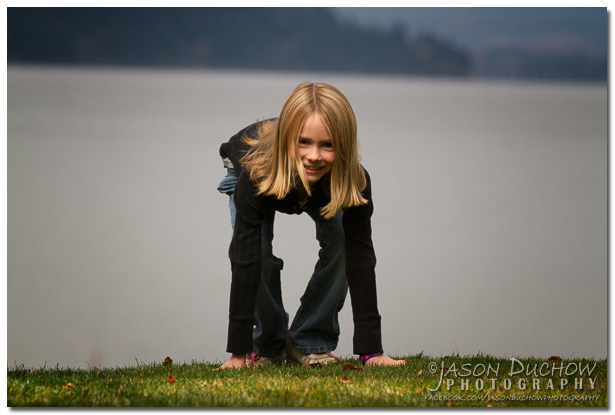 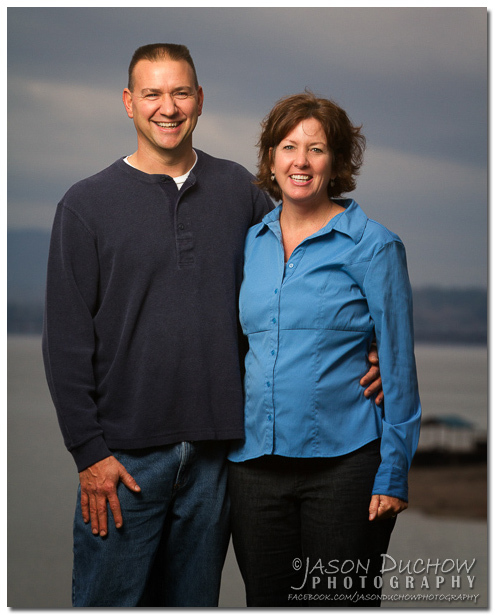 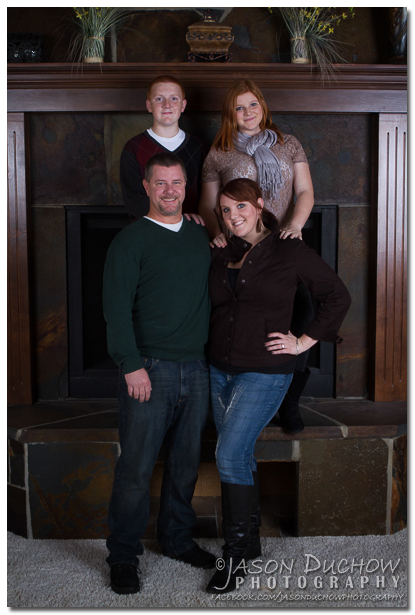 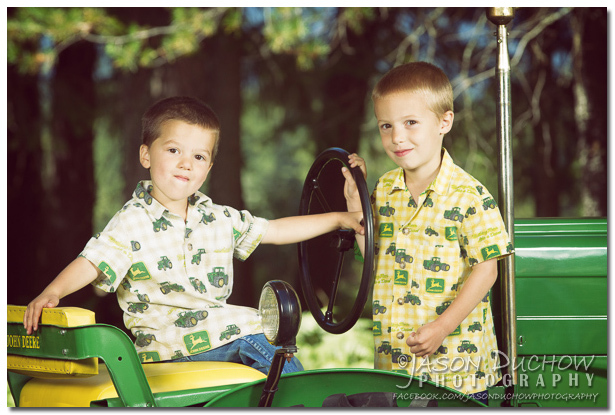 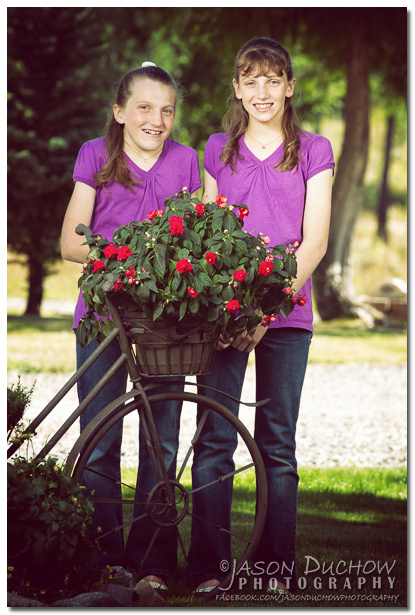 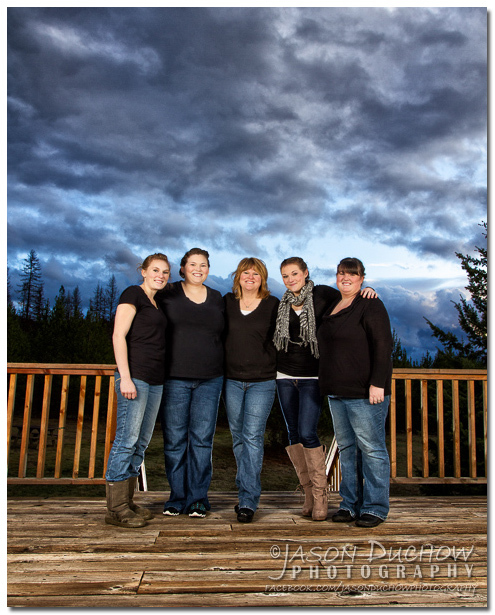 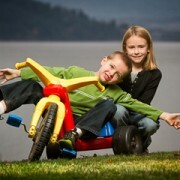 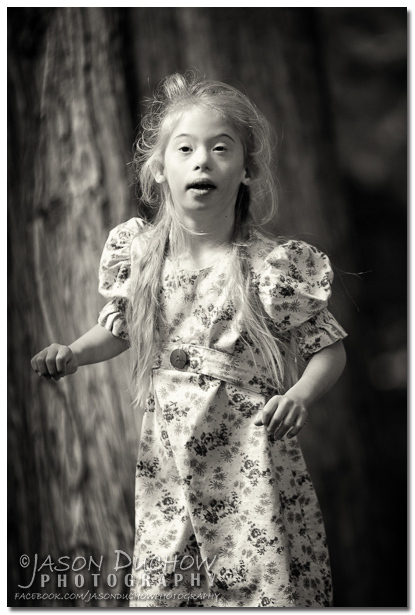 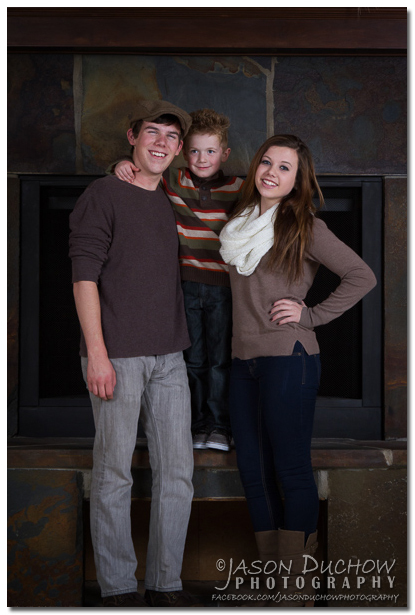 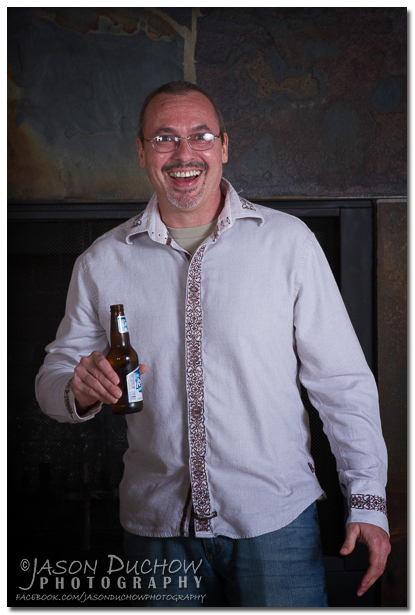 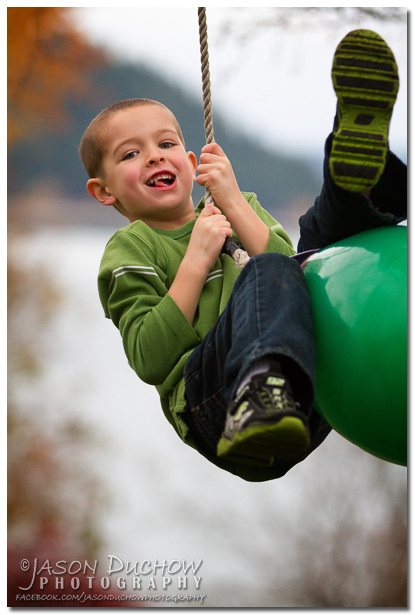 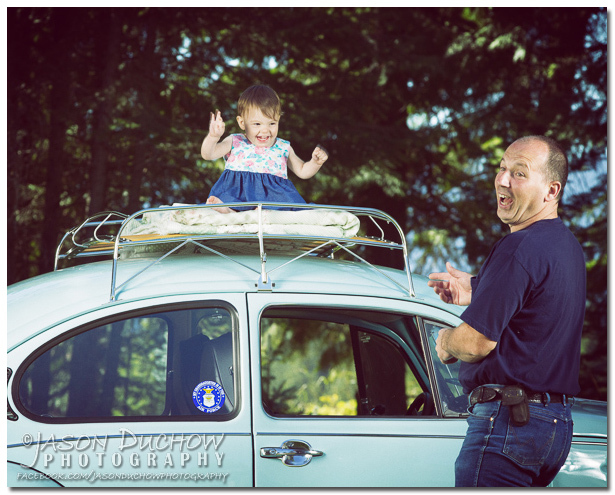 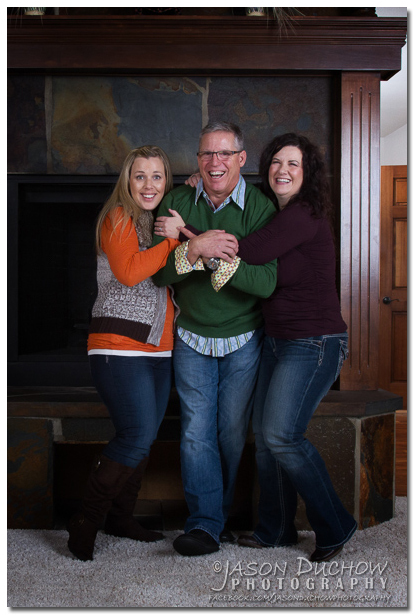 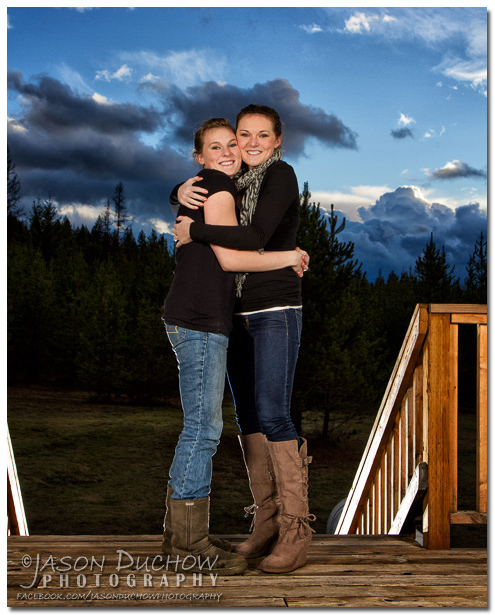 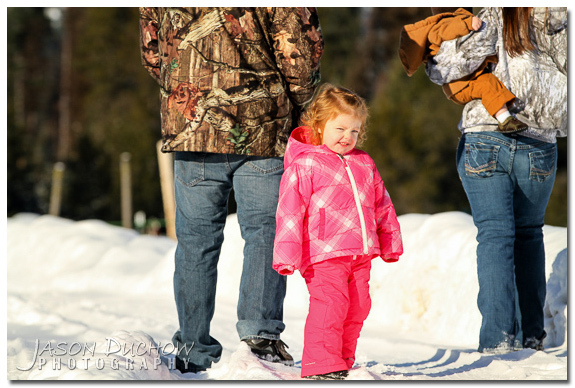 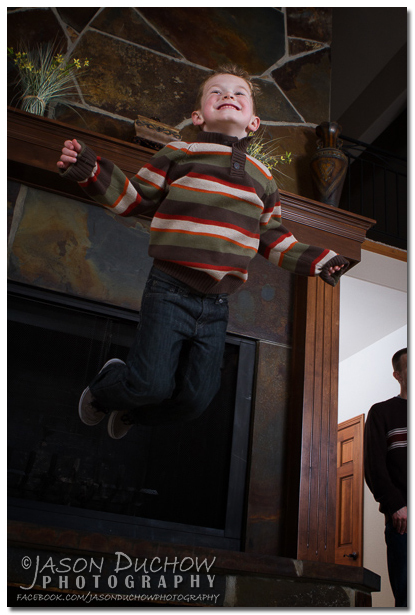 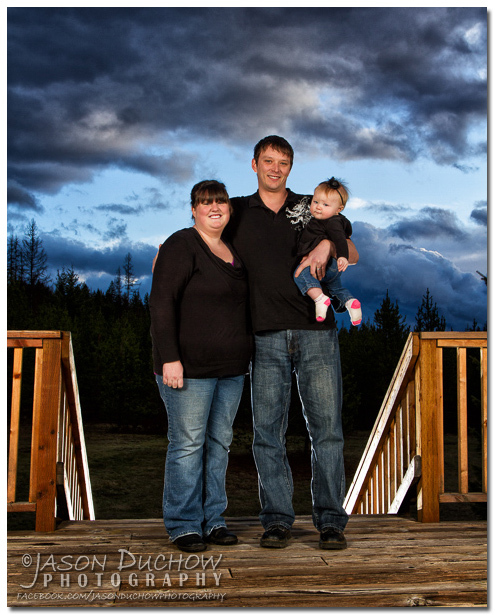 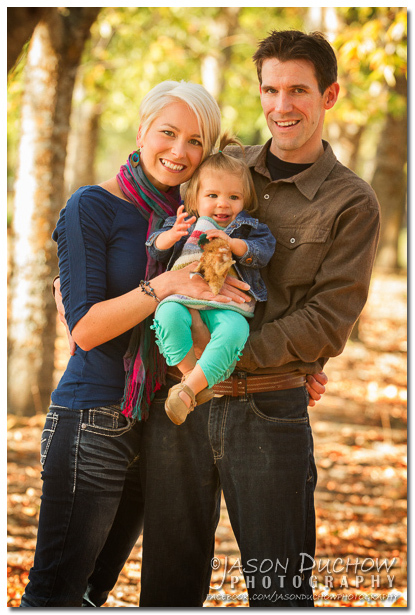 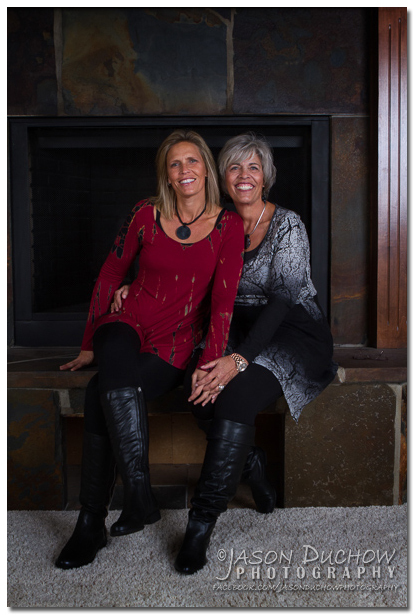 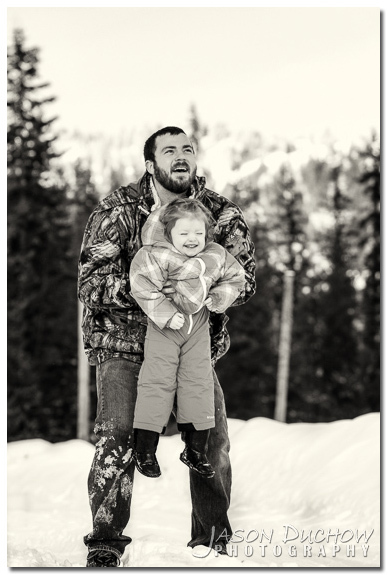 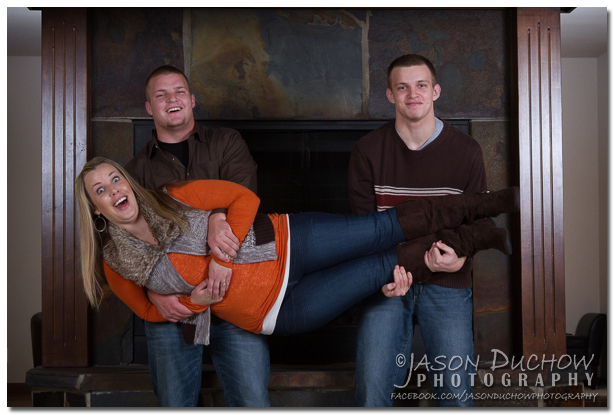 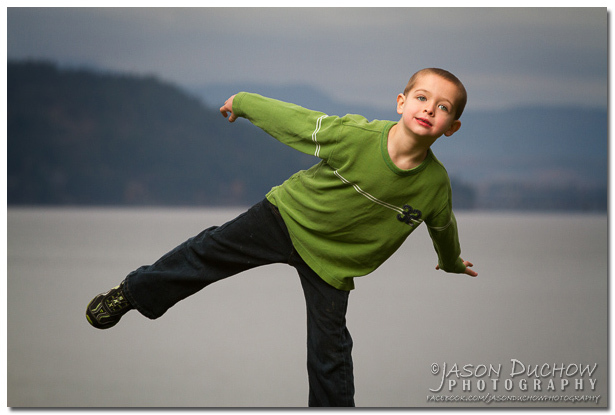 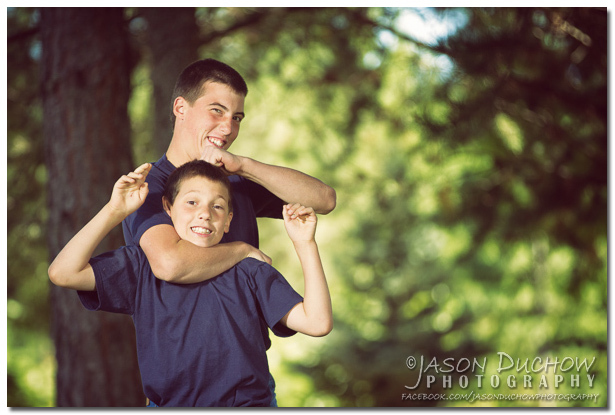 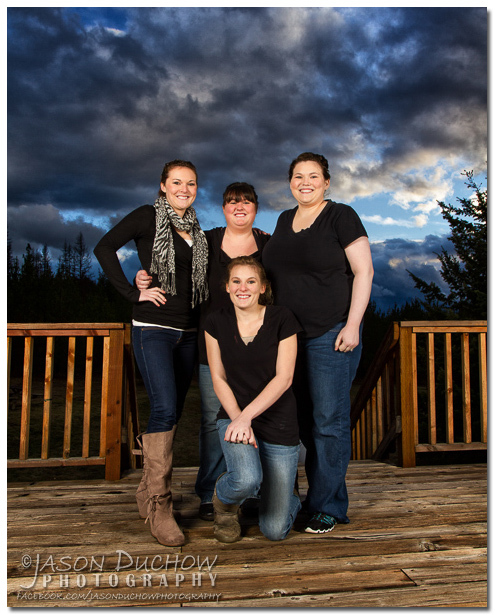 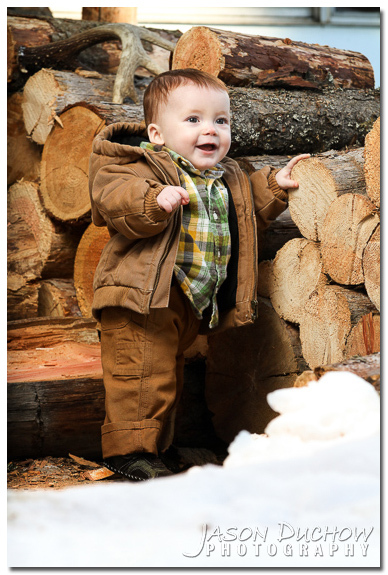 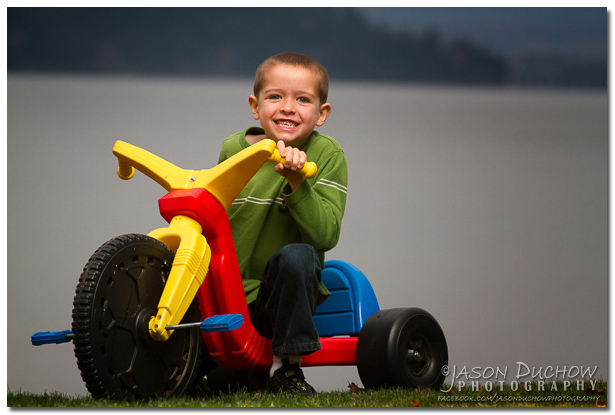 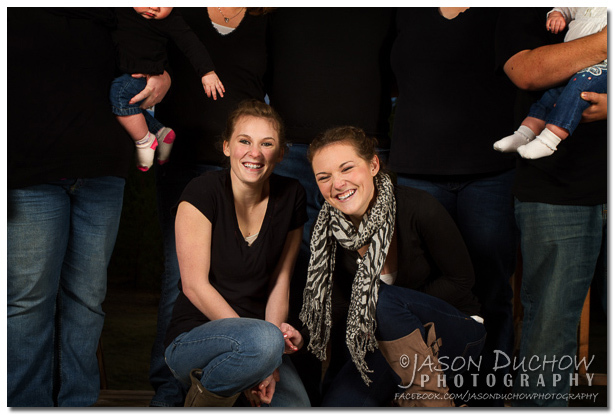 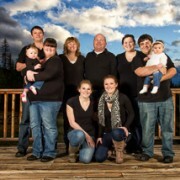 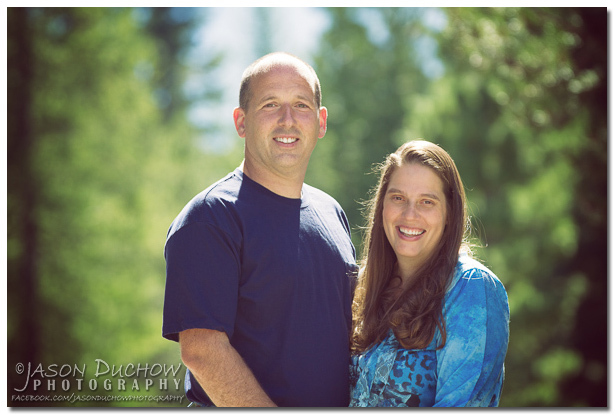 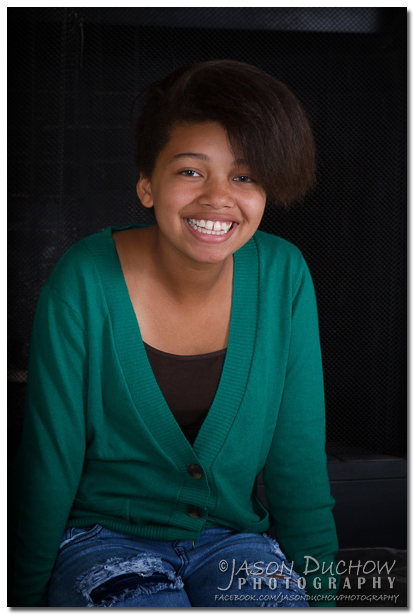 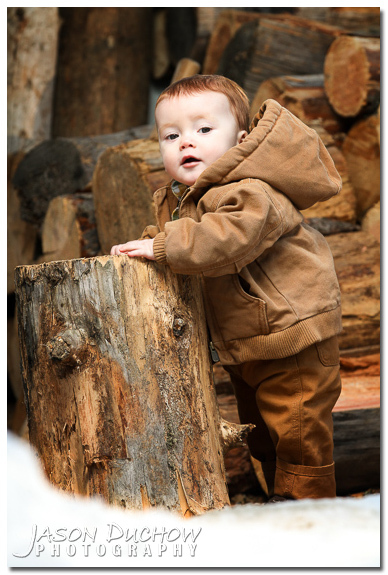 This last week I had a portrait session scheduled with a family that was gathering in Sandpoint for the weekend. 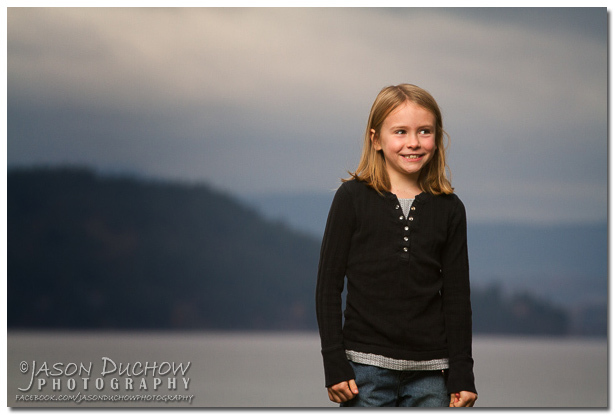 There was only 1 day that everyone would be together and available and the plan was to get some outdoor portraits with Lake Pend Orielle as the backdrop. 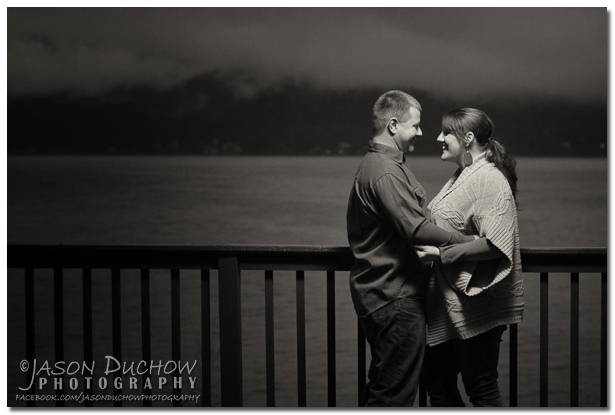 The day rolled around and of course it was raining, eliminating the possibility of outdoor portraits. 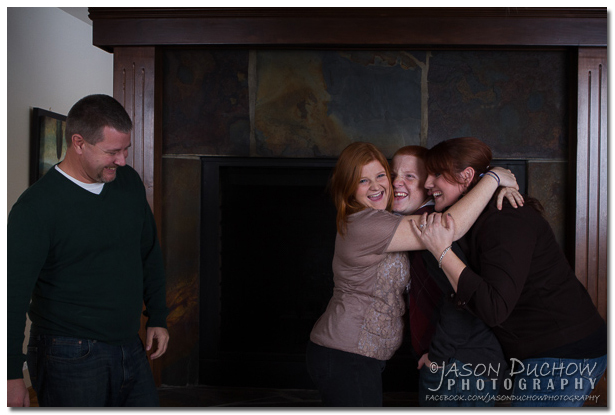 Since this was the only day that the entire family would be together it was decided that we would adapt rather than cancel and we set up for some indoor portraits in the house that they had rented for the weekend. 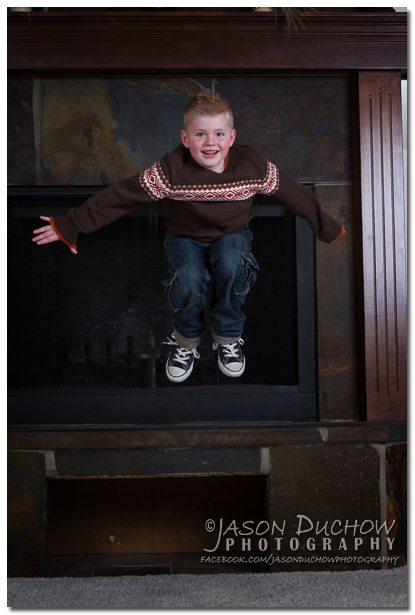 To give the room some depth and make the photo more interesting we added three more flashes to the setup with two strobes behind the chimney upstairs and one behind the chimney downstairs. 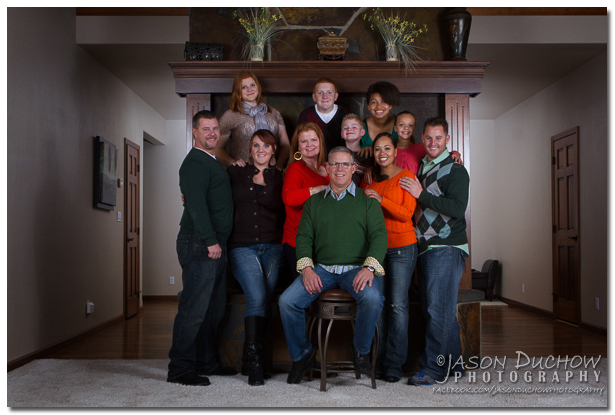 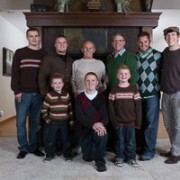 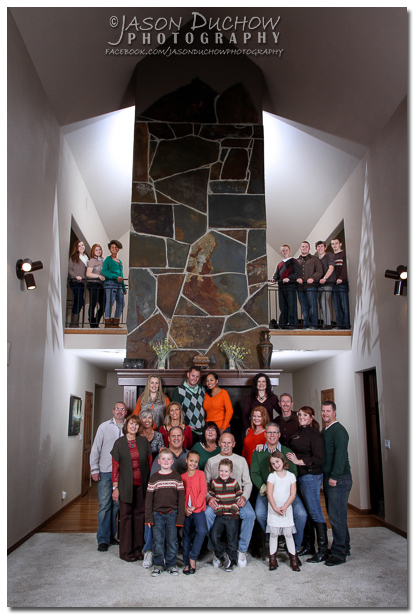 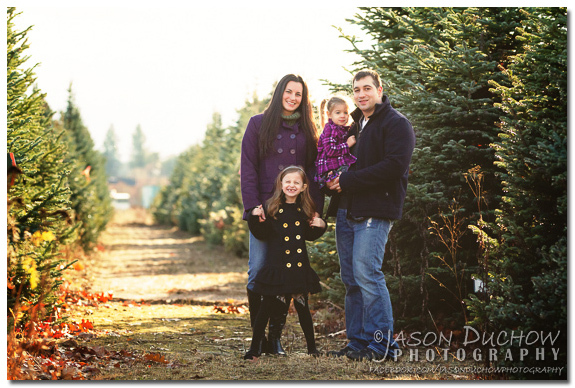 Here is the final image with the entire family, I think those extra lights made a pretty significant difference! 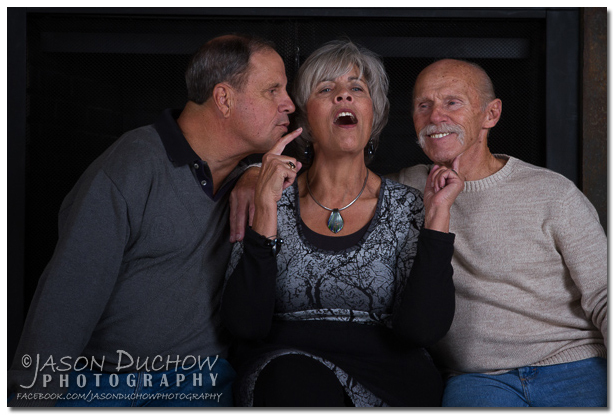 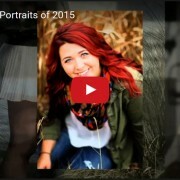 After getting the hardest photo out of the way we moved on to some smaller groupings, here are some of the portraits as well as some of the happenings between portraits! 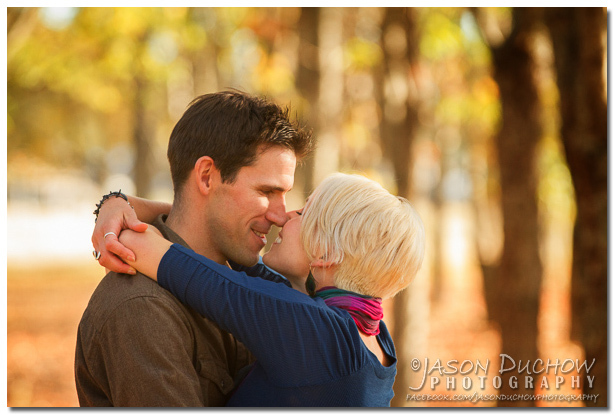 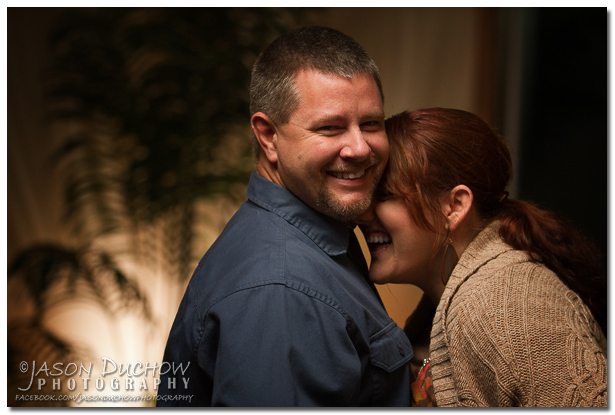 To wrap up the afternoon we even took a few engagement photos! 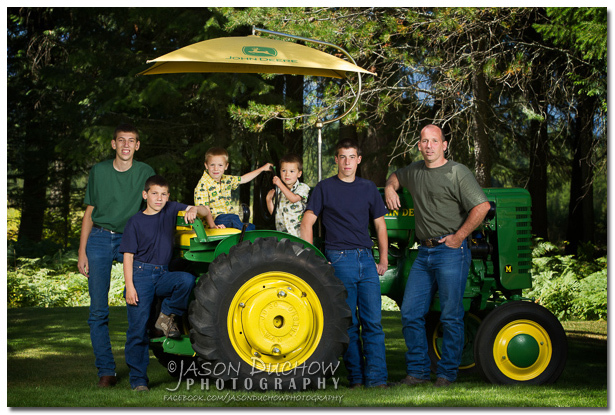 A while back I held a contest on my facebook page and wen the winners were drawn the cowell family was selected and chose to use their winnings for a family portrait session. 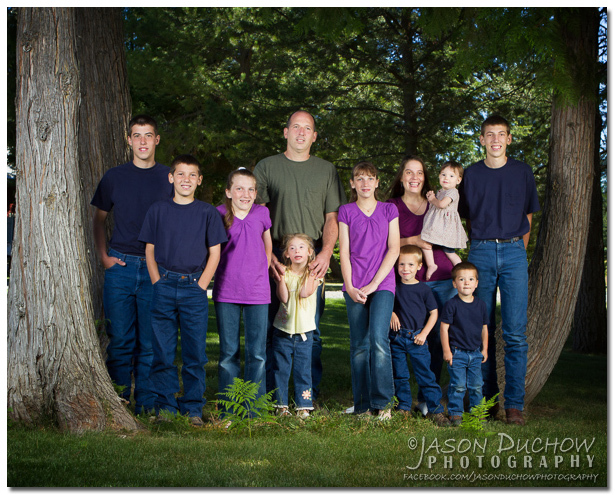 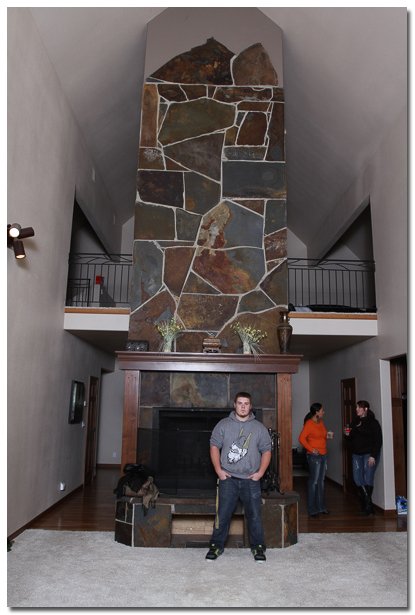 I have to say this was about the easiest group of 9 kids and 2 adults I have had the pleasure to work with! 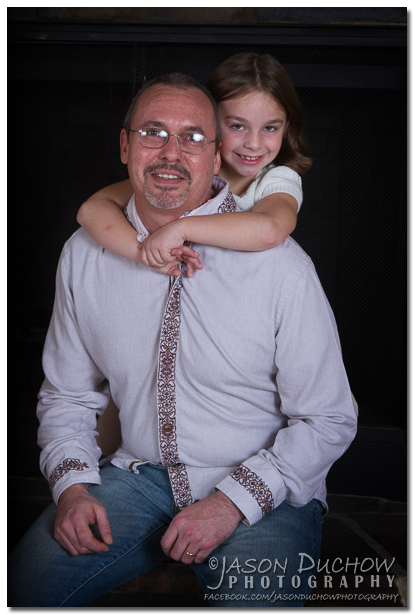 After the portraits were done we set up a couple of lights in a shaded area and just let the kids play, it did not take too long to fill up a card with fun, unplanned shots. 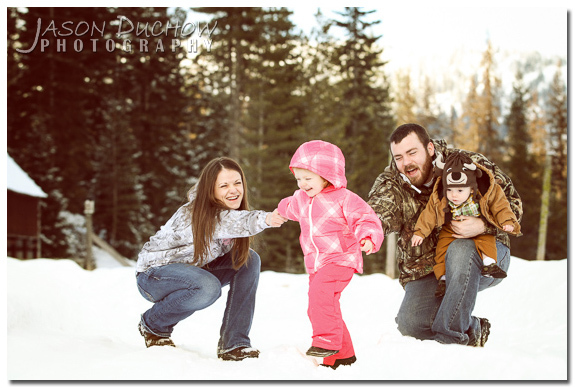 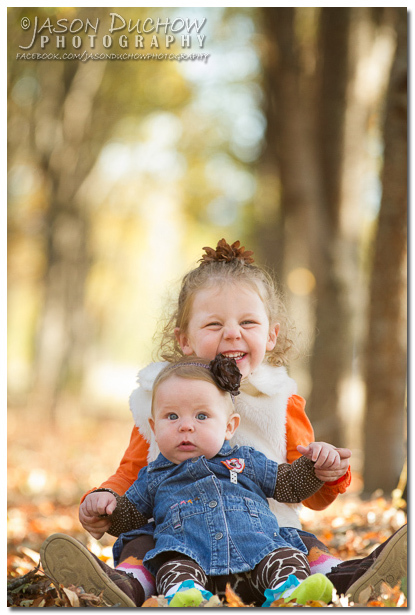 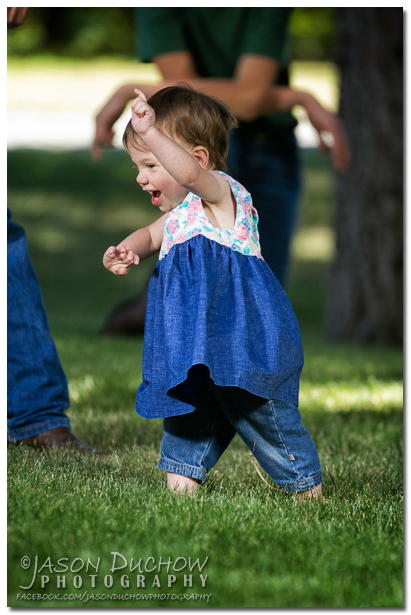 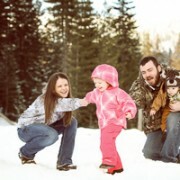 Here are some of the family’s favorites from play time!